Like a good home, a relationship is only built to last if it’s well-maintained. But with so many supporters to stay in touch with, it can be challenging for nonprofit organizations to interact with their audience regularly in authentic ways. Luckily, the Internet era established a new standard for connecting with others—through social media, in particular. It makes us constantly available to each other in some fashion. In fact, 85 percent of adults in America use the Internet, and 74 percent of those online have social profiles. Social media allows your organization to engage current and potential supporters in a natural, genuine way that is noninvasive, yet consistent. 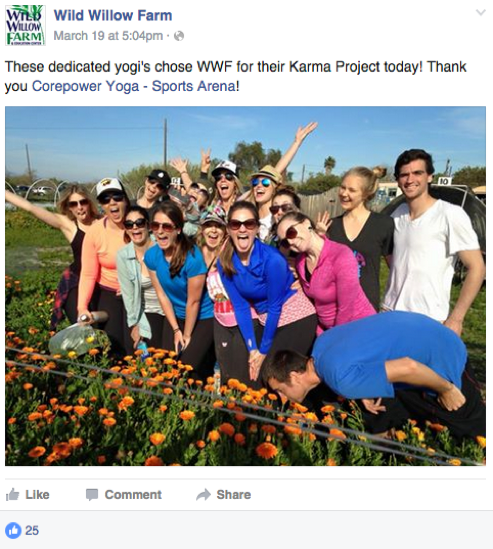 To get a firsthand account, we sat down with the Wild Willow Farm & Education Center (WWF) to better understand how nonprofits can use social media channels to nurture relationships with their volunteers, supporters, and beneficiaries. What started as an effort to preserve a local farm has now turned into a piece of land that serves the community at large. Wild Willow Farm & Education Center offers instructive resources for anyone interested in health, sustainable food practices, and farming. A large part of the organization’s culture centers around the idea of physically coming together to connect with each other and with the earth. Social media further deepens and sustains this connection beyond the physical experiences shared on the farm. When Wild Willow Farm realized the potential to use social media as a tool to nurture relationships, they began to use it more actively and crafted a strategy for continuous engagement. Just like many nonprofits, Wild Willow Farm has several different groups of supporters that they regularly try to engage: the alumni of their farming 101 classes, their volunteer base, their CSA customers, donors, and event attendees. In order to interact with this mix of individuals regularly in a way that resonates with each group, the organization had to develop a strong presence on specific social channels using the following strategies. 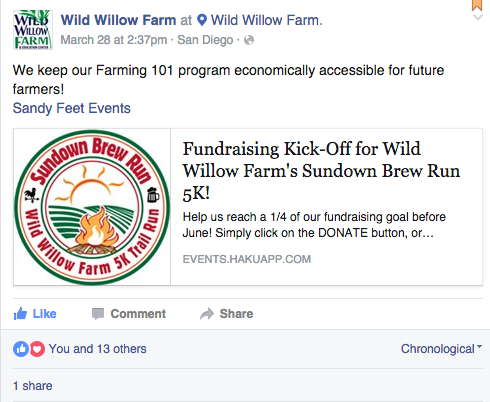 Wild Willow Farm uses social media to support their fundraising events, like their 5Ks. They closely monitor interactions, such as comments, in order to field questions and bolster excitement. Pro Tip: To help spread the news about their upcoming events, WWF provides participants with blurbs and images promoting the occasion. Supporters then share these assets with their personal networks to drive engagement and attendance. Wild Willow Farm understands that their volunteers come to the farm for different reasons. Some want to get away from everything for a few hours, while others may look to learn best practices for their garden. To deliver a highly valuable experience that will be sure to draw volunteers back, the team at WWF seeks to understand why each of their supporters gets involved. By acknowledging these different motivations in their social media communications, they can attract more groups of volunteers to join their program. Here, Wild Willow Farm calls out specific volunteers on Facebook and their reason for coming out to support the farm. Those who see this appreciative message can notice that others readily support WWF, recognize that the organization gets to know their volunteers, and may consider getting involved. One shout out on social media can go a long way in making supporters feel appreciated. By dedicating time to say thanks, Wild Willow Farm not only does a great job of making their volunteers and supporters feel appreciated, they also make their programs all the more appealing to potential supporters who view the images of all the fun. WWF follows the golden rule in their social media practices—they treat their followers as they would hope to be treated by another organization. Because of this mentality, they know how good it feels when an organization directly responds to you or acknowledges your support, and so they work to delight donors with shout outs and direct comments and messages. To make sure their message is heard, they tag others whenever possible and search for relevant hashtags to gain exposure. 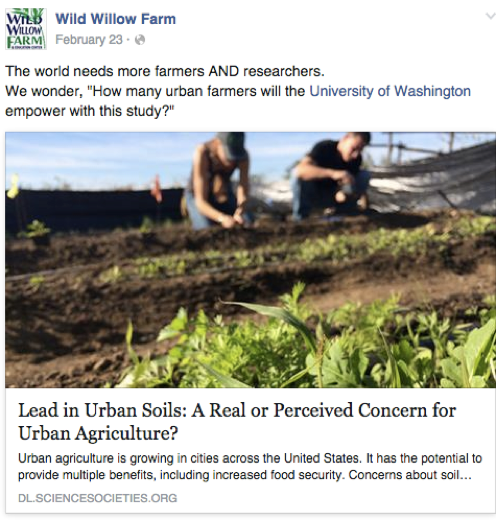 In order to continue engaging Farming 101 alumni after their classes, Wild Willow Farm set up a private Facebook group to help keep their alumni connected and facilitate a continued dialogue about their learnings. In this dedicated space, students can discuss industry-relevant news and continue their learning. The group’s activity keeps their experience with Wild Willow Farm top of mind, despite having already graduated from the farm’s class. Wild Willow Farm also recognizes social media’s power to connect them with possible corporate partners. For example, the farm has an existing relationship with Kashi, a well known food organization that shares similar values. LinkedIn, in particular, presents opportunities for Wild Willow Farm to continue reaching out to potential corporate sponsors. They also see this platform as an excellent means to establish professional connections with potential students, supporters, and sponsors. Rather than trying to have a presence on every channel, Wild Willow Farm focuses on the platforms that their supporters are most active on. This allows them to commit their time and energy to the places that matter. Wild Willow Farm dedicates most of its time on social media to Facebook and Instagram. However, they also maintain a presence on Twitter and use it as a tool to keep a pulse on their supporters and industry news. Wild Willow Farm takes special care to customize their content specifically to the focus of each channel. For example, WWF often shares relevant industry articles with their Facebook fans to inform and spark discussion. This approach isn’t as effective on Instagram, a channel designed for visual content. In WWF’s experience, posts that are designed with a specific channel in mind tend to perform better. By taking the time to differentiate their approach and write specific teasers, they deliver each message in a way that matches the expectations of the channel’s users. To help their supporters stay abreast of industry news and current happenings, Wild Willow Farm often posts to educate and inform. Their promotion of educational and timely content establishes them as a reliable industry source in the eyes of their supporters. This also helps their supporters understand how Wild Willow Farm fits into the big-picture movement. Here, Wild Willow Farm shares a recent study to break down a relevant topic for their supporters. Every time the development and volunteer coordinator at Wild Willow Farm posts an image on Instagram, she asks herself if she would take the time to show someone in person on the farm what she’s posting about. If the answer is yes, she goes for it. This approach makes her posts genuine, unique, and generally informative. When you share valuable and not just self-serving content, your channels become a place your supporters look to and rely on for information. Strive to maintain authenticity and you will ensure the information you share remains personable and relatable. What platforms make the most sense for your organization? Discover the elements that set each channel apart in The Big Social Media Guide for Nonprofits. A focused approach can expand your audience, build your relationships, and lead to a more engaged community and donor base.